10/16/2009Share this story on Facebook! The homes of EVI exemplify the sustainable benefits that planned communal living offers. They’re heated through a shared hot water system, with one gas boiler allotted per eight homes, and are built with a double wall design that allows for more insulation than usual. The space between the walls is stuffed with dense-pack cellulose (made from recycled newspaper). The windows in FROG are triple-paned fiberglass designed to insulate the home and absorb as much sunlight as possible. Houses have been adorned with vines to keep them cool in the summer. SONG homes were custom built for individual families, and their specific budget affected the construction. SONG, built several years after FROG, boasts more cutting-edge building materials and techniques than FROG, like structural insulated panels, super-insulated roofs, straw bale insulation, rainwater collection, composting toilets, and drain heat recovery. Ithaca College’s environmental studies program has been growing steadily since its inception. The addition of new majors and opportunities has given students the chance to explore their own ideas and learn from the experiences of others in the field. One of the most exciting of these is IC’s partnership with EcoVillage at Ithaca (EVI), a sustainable living community located just minutes from the College. “These courses in sustainability are a good way to develop a focus for our program, and the partnership with EcoVillage gives our students the use of facilities that very few other programs have access to." From evaluating green houses to researching the plausibility of planting heirloom crops, students apply what they’re learning in class to real-life problems at EVI. Courses in environmental studies are taught collaboratively between IC professors and EVI residents to ensure that students receive the most relevant and practical education. “These courses in sustainability are a good way to develop a focus for our program, and the partnership with EcoVillage gives our students the use of facilities that very few other programs have access to,” says Susan Allen-Gil, assistant professor of biology. The city of Ithaca has always been known for its progressive thinking. Many Ithacans have made their daily lives more eco-friendly by walking to work or using canvas bags during their weekly trek to the grocery store. Over time, these small changes can make a big impact. The residents at EVI have gone the extra mile and practice sustainable living in almost every aspect of their daily lives. 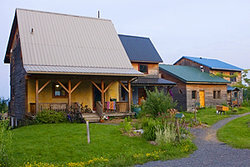 EcoVillage was the first co-housing neighborhood in New York State, and the 25th in the United States. There are 60 houses in the complex, which is comprised of two neighborhoods, FROG and SONG. Construction of TREE, the third village, is currently underway. As part of the Partnerships for Sustainability Education, Ithaca College offers mini-grants of $1,000 to educators at IC or EcoVillage who would like to develop or modify a course to incorporate sustainability into the educational experience. 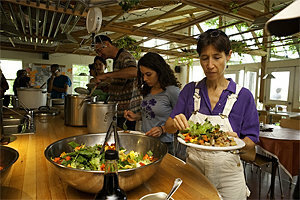 Since the beginning of this program in 2003, nearly 60 grants have been awarded to College faculty, staff, students, and EcoVillage residents. Educators have reworked traditional course topics from art history to psychology to incorporate a sustainable perspective. IC students are reaping the benefits of sustainability education, but the collaboration is also having an impact on EVI and the greater Ithaca community. This September, one student’s project proposal -- the building of the New Roots Charter School, a sustainable high school in Ithaca -- will be put into action. The goal is to create a sustainability-based high school in which students are taught through a variety of theories and practices. New Roots will open in September with an anticipated 125 ninth- and tenth-grade students. The creation of a true learning community between Ithaca College and EcoVillage is an inspiring example of the potential that lies in collaboration.